Starring: Josh Brolin, Ryan Gosling, Sean Penn, Nick Nolte, Emma Stone, Giovanni Ribisi, Robert Patrick, Anthony Mackie, Michael Peña, Jack McGee, Jon Polito, Josh Pence, Mireille Enos, Sullivan Stapleton, John Aylward, James Carpinello, Don Harvey, Ambyr Childers, Frank Grillo, James Landry Hébert. Although I’ve yet to see director Ruben Fleischer’s previous comedy film “30 Minutes Or Less“, I did manage to catch his debut “Zombieland” which injected a lot of humour and style in the zombie sub-genre. For his third film, he assembles one of the year’s most impressive casts and decides to drop the comedy and focus on a real-life crime story. His stylish approach is, once again, on show but unfortunately, his film suffers from a dreadfully threadbare script that fails to utilise his very talented ensemble or elaborate on a story with massive potential. Los Angeles, 1949. Mickey Cohen (Sean Penn) is determined to take hold of the city and muscle out any competition. Police Chief William Parker (Nick Nolte) has other ideas, though. He forms a squad of no-nonsense cops to fight back and puts World War II veteran John O’Mara (Josh Brolin) in charge of the operation. O’Mara assembles his crew and tackles Cohen’s organisation with the same brute force that the criminal acquired it with. From the off-set, Fleischer doesn’t waste time in getting down to business. The brutality of Mickey Cohen is captured within the first few minutes by a scenery-chewing Sean Penn, on menacing form. Following suit, we are then introduced to Brolin’s strong arm of the law, charged with bringing this notorious gangster to justice. Straight away, Dion Beebe’s gorgeous cinematography and production designer Mather Ahmad manage to capture the glitz and grime of late 1940’s L.A. and it looks like we could be treated to something akin to Curtis Hanson’s sublime “L.A. Confidential“. Unfortunately, the look and feel is where the comparison ends. This isn’t anywhere near as tightly constructed as James Ellroy’s labyrinthine thriller and that’s the most frustrating part; it could have been. The elements are in place but the all-important script seems to have it’s concrete shoes on. The writing is repetitious and lazily strung together and for a film that’s seemingly focused on it’s characters, it ultimately fails to deliver anything that resembles a three-dimensional role for any of the impressive cast on show. 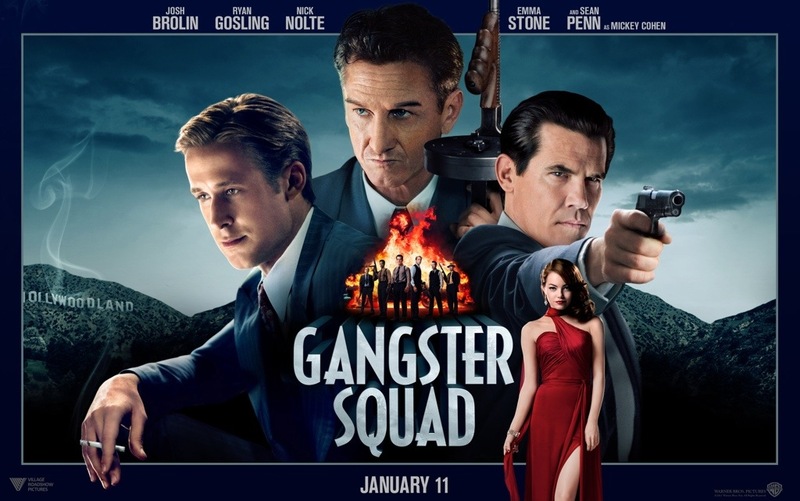 Brolin, Gosling and Penn get most of the screen time but this is a role that’s completely beneath the abilities of Gosling as he takes a back seat to the other two and the talented likes of Ribisi, Mackie and especially Peña needn’t have turned up at all. It all but completely abandons the good work it sets out to do and resorts to stylistic action scenes that are drawn out and devour the latter half of the movie – eventually leading to nothing more than a shoot-em-up and an obligatory toe-to-toe thrown in for good bad measure. Quite simply, the whole thing comes across as a poor case of cut-and-paste and squanders what little powerful scenes and performances it does possess. It’s a real shame that this ended up so superficial when it had so much potential. Instead of being a passable piece of pulp with too much reliance on it’s star wattage, it could have been a solid addition to the gangster genre. I’m sure Fleischer believed in the material at one point but my Tommy-Gun’s not convinced. This entry was posted on May 1, 2013 at 10:12 am and is filed under Action, Crime, Drama, thriller with tags 2013. You can follow any responses to this entry through the RSS 2.0 feed. You can leave a response, or trackback from your own site. The cast are great Ewan and few, if any, put a foot wrong but apart from Penn and maybe Brolin, none of them have very much to do. I couldn’t completely slate the film as it looks the part and has a lot of style but ends up rather empty. Nice review. I agree with you that it didn’t use the cast to their full potential, but I still found it quite entertaining. Thanks man! It was reasonably decent entertainment but it could have achieved so much more. It felt like a missed opportunity to me. Nice review man. I’ve waited on this thing mainly because of the reviews. Your take is actually a tad kinder than some I’ve read so maybe I can find a little fun in it. Cheers bro! Yeah, there are many thing to admire. The cast and style being the most noteworthy but don’t expect a classic and you should find some entertainment on a quiet evening. Good deal. OH, be sure to check out my Mud review when you get a chance! Mud you say? Nice one! I will do. I’m still playing catch-up after some time off. Could have been a hell of a lot better, but at least it was entertaining enough to watch. Couldn’t have asked for anything more, especially when it came out around January. Good review Mark. That’s a fair point Dan. January movies rarely have anything going for them. I agree that it passed some time fairly pleasantly but it is a bit irritating that they didn’t make the most of it. Hmm, I was initially planning to see it theaters, but ended up missing it. Nice review. Yeah, man! “Hmm” about sums this up. I considered a 2.5 star rating but there was just enough for it to pass as entertainment. You’ve said saved yourself some money here. Nice work, Muckers! I’ll probably catch this sometime when it’s free. I’m not a big fan of the Pennster. Cheers bro! I actually quite like Penn and he’s good here (a bit over the top though). Don’t waste your pennies on it, man. Wait for tv and when nothing else is available and you won’t be too disappointed. Missed this one it theatres… 3 out of 5 is about where I’d expect it to be though. I’ll have to catch it when it hits cable. It looks great Fogs but still not worthy of a theatre viewing. 3 stars is generous, it really should be a little under that. Yeah, this one was pretty disappointing. Really doesn’t sit well over time, either. Too bad, ’cause the potential was there for something good, but oh well I suppose. Nice review, man. Cheers Chris. Yeah, it is quite frustrating that it passed up a fantastic opportunity. Decent pulp but not much else really. Glad to hear you feel the same. Hollywood loves this genre. After all, just wheel the cameras out the backdoor and start filming, a lot of L.A. still looks like a 40’s movie set. This flik’s more like the Untouchables than LA Confidential, or at least it wants to be. It’s just so cut and dried. The bad guys are oh so bad, the good guys extra-good. It gets unbelievable. There’s a Cowboy goodguy with a revolver who out shoots guys with sub-machine guns. Never gonna happen. This film noir totally misses the noir! “This film noir totally misses the noir”. That comment sums this up brilliantly Ray. Glad you mentioned Robert Patrick’s Cowboy! I mean, that was just ridiculous and Anthony Mackie’s character could only be identified by wielding a flick-knife – that he very rarely used. As for Michael Peña, what was he even doing there? Cheers Andy. Glad to hear you felt the same. It seems that a lot of people share this opinion. Not terrible but not exactly great either. If the cast wasn’t so impressive, the hopes wouldn’t be as high. I was even less impressed than you on this Mark. It’s too much ‘style over substance’ and yep, it certainly isn’t anywhere near as tightly constructed as LA Confidential. I feel like the director is too enamored by the gangster era but only on the surface as he never quite captured the grit of the story. I actually don’t find Penn menacing, more comical actually under than makeup, ahah. It wasn’t fantastic and I wouldn’t wholeheartedly recommend it to people but it was reasonable entertainment. The cast and premise are great but sadly, it doesn’t make the most of it. Passable entertainment, though. Great cast and seems like a bit of a missed opportunity this one. Might be OK for a rental at some point I reckon. After all, who can resist the Stone/Gosling duo?! Maybe worth a rental Chris. If you lower your expectations then you might find yourself enjoying it. I lowered mine and found some plus points. As for the Gosling/Stone chemistry, it doesn’t even take advantage of that. I watched this in a theatre in the beginning of the year and I’ve already forgotten about it. But I really didn’t care for it. Too cartoonish and clichéd for my taste. Besides I guess it doesn’t help that I’m overall a little bit done with gangster movies, though there are exceptions of course. But you need to be pretty damned good to win me over. Can’t argue with you here Jessica. Cartoonish and Cliched is a perfect way to describe it. I found some enjoyment because I’m a bit of a sucker for gangster movies but this will no doubt fade into a mere memory for me as well. It passed the time and was decent enough but I’ll soon forget, I think. Nice review. I had fun with this one, but I hadn’t heard much about it when I watched it. By no stretch great, but good, fun, light popcorn entertainment! It’s not great and could have been much, much better. I think a more experienced director would have done a better job. That being said, I totally agree with your “popcorn entertainment” statement. It passes the time. It does. And I thought it was hilarious when they did their prison escape. Like I said, I think we missed the news and hype about this in my country, and after reading so many reviews that slammed this I knew not to expect greatness or a serious mob movie, and I think that counted in the film’s favour. I was the same. I didn’t expect very much from it and it worked to an extent. It could have been much better but hey, we can’t have everything. Such a pity we can’t. Damn.